vicinity of Long Island, NY. St. James is a lovely town which is a short distance from my own home. (a historic house open for tours). While there, my obsessive nature about research and old homes took hold of me! I compiled a few (less than stunning) photographs of his estate that I'd like to share with you. 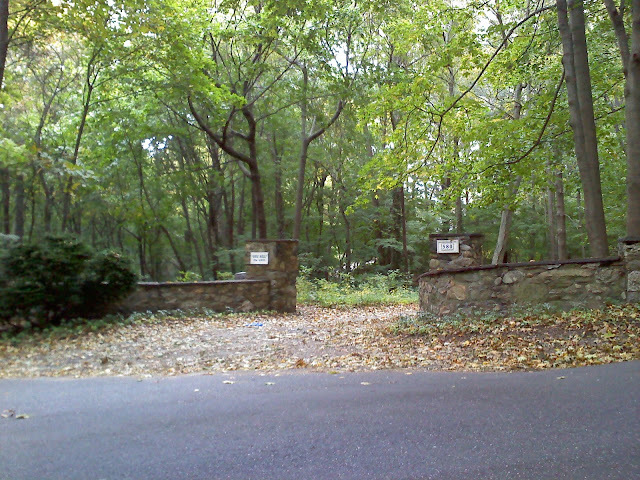 Below, is an additional entrance to the estate. As you can see there are several structures on the property. I understand that these are additional homes used by Stanford's family to this day. From the road leading to home there is an allee of trees. a better view of Stanford's creation. FAMILY HOME at BOX HILL. GARDEN structures at BOX HILL. Interested in viewing original photos of BOX HILL in it's HEYDAY? Mrs. Kate Smith Wetherill was Stanford's sister in law. Kate was his wife Bessie Smith's sister. The Wetherill mansion was designed by Stanford and built in 1893. It is connected to Box Hill and I understand Stanford sold the Wetherill's the land that the estate now sits on. It is quite massive and imposing with what appears to be 3-4 stories tall on one side. It is set high on a hill overlooking the harbor. A view of the harbor from near the WEATHERILL estate. This is ST. JAMES EPISCOPAL CHURCH which is located on 25a in St. James NY. The adjacent cemetery is the final resting place for Stanford White and his wife Bessie Smith White. Stanford's funeral service was held here in a small gathering far from the swirling media frenzy that ensued after his murder in Manhattan. I walked through the cemetery on the spur of the moment and was unable to find his grave. Which indicates yet another trip to ST. JAMES is on the horizon! Special thanks to my new friend LANA from LIFE AT WILD BERRY COTTAGE who inspired me to complete this blog entry! Thanks for the kudos. I love the photos of the estate. Always great to hear about these historic places on Long Island. Just saw "Treasures of New York" and decided I must see Gould Library and Box Hill. Apparently Box Hill is not open to the public although it is in the National Historic Record. This is the closest I suppose I will get to Box Hill, so thank you for your pics. I still would like to investigate St James... fascinating. White's grave is the most prominent one in the cemetery. Large monument. You probably walked right by it. No worries. You'll see it next time you visit. I live a few blocks away. Thanks for the photos. Enjoy your next visit! Hi Maureen! Thank you so much for posting. I had gone to the cemetery with a friend who was visiting another grave site so I guess we lost focus. I must get back there soon and look for the most obvious monument! Anonymous poster, I'm so glad that my post of Box Hill was useful to you. I do recommend visiting St. James it's really very lovely. I'm not sure I ever noticed that the sign says "dust" instead of "dusk". Very funny! As for me, I recorded but have not yet watched the Stanford White episode of Treasures of New York. It's a bitterly cold day in New York. Perfect time to cozy up with a blanket and my DVR. Thank you for reaching out!